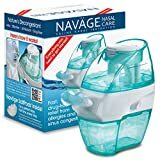 →Navage Reviews: Automatic Nose Cleaner, Does It Works? Navage as seen on TV, is a nose cleaning device that could be used to provide relief when you are suffering from sinus and blockages issues. And it does the cleaning process in the very controlled way. We have tested this product ourselves and after that, we are going to write Navage reviews 2019 here. We hope this will be beneficial for you. You can also read Navage reviews on Amazon. Navage as seen on TV claim that they are the world’s only nasal irrigator that uses gentle powered suction. They say it is clinically proven to relieve sinus problem. They are also saying that with regular irrigating of your nose your breathing becomes much better. It is really very important to understand that How Navage Works? Here we are going to explain. The device looks almost like a small humidifier that comes with clear front and two nose prongs which is attached to it. To use it, all you need to do is just line up your nostrils to the spouts which come with the pack and then turn it on. Then it will send warm, salted water through one nostril, around your sinuses and blockages, and then it comes out from another one. The warm water is really soothing, and the saline solution is used to draw nasties and other impurities out of your sinuses and blockages. It’s the best way to get rid of detritus and other dirt that might have built upon your sinuses. But the main purpose of using it is to remove mucous blockages and as a remedy for the sinus problem. This type of device is available form so many years. But the thing that makes Navage different is that it is fully automatic, less intrusive and their is very less chance of getting it wrong and ending up with water in your throat and your ear canal. You can use Navag when you are suffering from flu or cold and are looking for some fast relief. This is a really very effective device. After all, it does the congestion process automatically which we have been performing manually to help with congestion for years. And all thanks to its incredible design, it does all of this very efficiently. We have already mentioned that mostly Navage reviews are positive. A few customers have had an issue with its the price. The price is little bit high. But, when we consider the effectiveness and the quality of the product, there were no many complaints seem to be. As we have personally tested this device so our overall Navage review is positive. We have told you whatever we observed. We have given you our Navage review and also told you what other Navage reviewers have to say about this product. Now you have to think about this product, whether you are going to buy it or not. This Navage Reviews 2019 video will help you to understand more about It. Watch now! 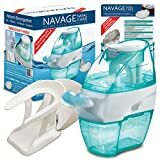 Navage Nasal Care Essentials Bundle: Naväge Nose Cleaner, 36 SaltPod Capsules, and Countertop Caddy. $116.90 if Purchased Separately; You Save $16.95. available online. But the quality and price of the product vary. Navage is the average price product. Also, its saline delivery system is different which makes it more effective. For those who suffer from sinus and blockages problems, Navage is the great device which you can try. Its different vacuum-based cleaning technology gives instants relief to all those who use it. We have noticed that most users have given 4.5 to 5-star rating. Although the price of this product is bit high but apart from it the quality is too good. There are also some products available which provide this level of relief to such an annoying problem.I hope this Navage Reviews help you to understand more about this product. If you want to know more about the product then you can also read navage reviews On Amazon. For safety and convenience, reliability and effectiveness, the Naväge Nose Cleaner only works with genuine Naväge SaltPods. You'll LOVE that clean nose feeling!